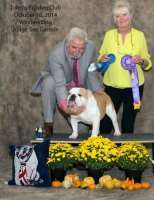 LAKEWINDS - WE ONLY BREED THE BEST TO THE BEST!! CH LAKEWINDS INVICTUS - This almost solid "brilliant red" dog finishes quickly and goes BOW at huge specialties - he has an almost all English background and is producing healthy, sweet tempered and show quality puppies!!! 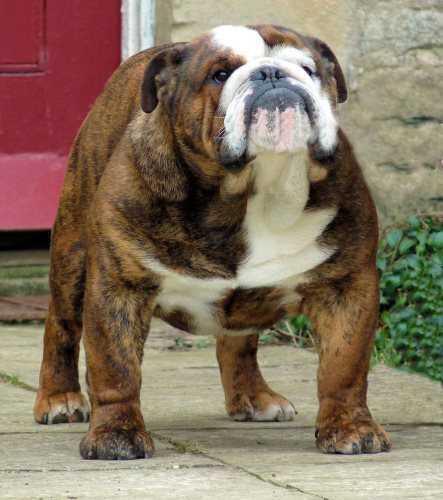 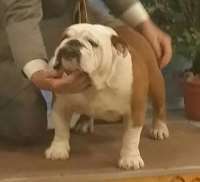 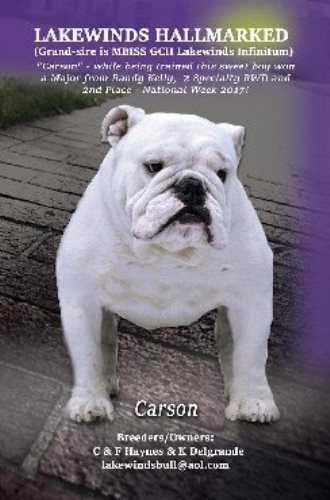 WE HAVE BEEN BREEDING BULLDOGS FOR 35 YEARS AND ARE PARTICULARLY INTERESTED IN HEALTH . 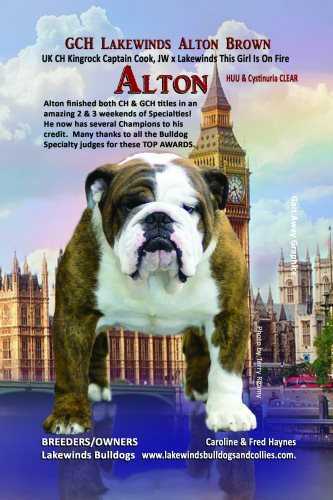 WE HAVE IMPORTED DOGS FROM ENGLAND AS FOUNDATION STOCK - THERE IS NO SUBSITUTION FOR QUALITY AND WE BELIEVE THAT WE HAVE WORKED VERY HARD TO PRODUCE WONDERFUL CHAMPIONS WHO ARE HEALTHY, SMART AND MAKE WONDERFUL COMPANIONS , WE HAVE WON WINNERS DOG AT BCA NATIONAL SPECIALTY WEEK WITH CH. 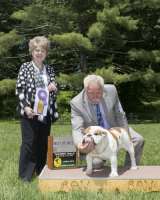 LAKEWINDS CHARLIE POTATOE, WINNERS DOG AND BEST OF WINNERS WITH GCH. 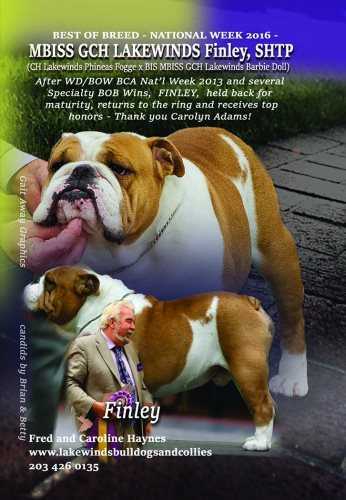 LAKEWINDS FINLEY S.H.T.P. 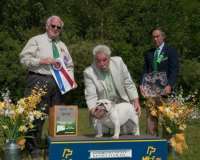 , RESERVE WINNERS DOG WITH GCH. NOBOZZ ENTER THE DRAGON AND BEST IN SHOW ALL BREEDS WITH OUR BIS, MBISS GCH LAKEWINDS BARBIE DOLL. ALL OUR MALES ARE CONFIDENTLY OFFERED AT STUD TO APPROVED FEMALES. 2/11/2014 Dog White GCH. 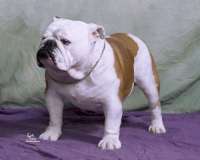 Lakewinds Finley S.H.T.P Knockdowns Delta Nu "Elle"
UK Ch. 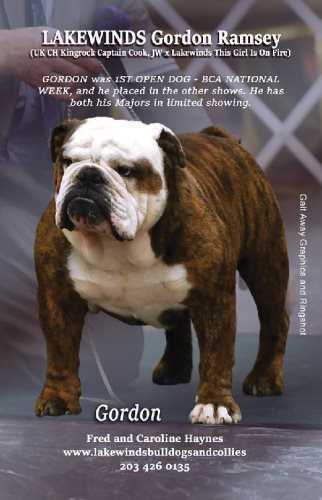 Kingrock Captain Cook.